“The course gave me confidence in myself – and the specific horse care knowledge which I wouldn’t have gained just through working at riding stables. Broomfield Hall’s Horse Management course was ideal for me. As well as learning about the practical aspects of horse care, we were taught a lot of theory. I particularly enjoyed studying the behavioural and welfare side of horse care. I also completed the British Horse Society Levels 1 and 2 qualifications and the Riding and Road Safety exam, which Broomfield put me through. “Since leaving college I’ve always been able to find work with horses and four years ago I got a job with Pool House Equine Clinic in Lichfield. Until recently I was based in the yard where I assisted the vets with scanning, X-rays and procedures such as dental surgery. 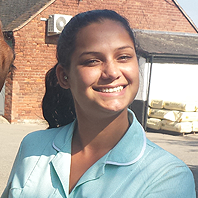 At the beginning of September my role changed when I became the clinic’s first ever Trainee Vet Nurse. My new role consists of assisting the vets with daily appointments and emergencies, learning how the laboratory is run and also assisting in surgical procedures. As part of my three year veterinary nursing course I have to know about small animals as well as horses, but once I’ve completed my training I will be able to specialise as an Equine Vet Nurse. Find out about studying Horse Management at Derby College.